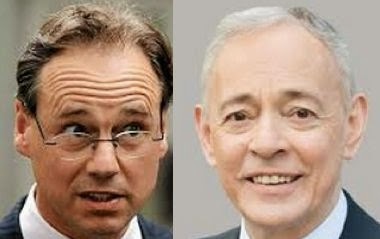 "Settled Science" and Greg Hunt. Des Moore was deputy secretary of the Federal Treasury until 1987. He is the Founding Director for the Institute of Private Enterprise. Below is Des' letter concerning the ever changing climate and the un-settled science. Some readers of The Age might possibly be waiting with bated breath for Abbott’s forthcoming meeting with Obama to reveal “damaging” differences on emission reduction policies and for Obama to insist on climate change being on the agenda for November’s G20 meeting in Australia. While it is difficult to stop such a discussion at any such meeting, Saturday’s Age ran a front page scary article entitled “US ties at risk over Climate” and drew on a World Wildlife Fund publication suggesting emissions reduction targets of certain countries to be lower than Australia’s. But the article seriously misrepresented policies actually operating or likely to become operative to reduce emissions. For a start it mistakenly reported that the Obama administration will cut carbon dioxide emissions from US power plants by 30 per cent below 2005 levels by 2020 (it is actually by 2030). Also, despite another article in the same Saturday’s Age reporting that China has no cap on emissions, the front pager omitted China (now the biggest emitter) and several other major countries with no emissions reduction targets. Indeed, no mention was made of the fact that lower income countries are now (collectively) the biggest emitters and are highly unlikely to accept any international agreement to a substantive reduction in the use of fossil fuels as principal sources of energy because they recognise that this would reduce their economic growth. Nor was there any reference to the continued failure of official average global temperatures to rise over the past seventeen years or to the recent detailed and extensive report by the Heartland Institute in the US, compiled by many expert scientists (including Australian Bob Carter), identifying serious problems with the analyses and predictions in IPCC reports, notably the failure to take adequate account of changes in temperatures which are primarily due to natural influences (see the attached summary of the NIPCC report). New research by physicist Dr Tom Quirk adds serious questions about the IPCC analysis. He shows for example that the existing maximum and minimum method of calculating averages produces a systematic upward bias, probably as much as 0.3-0.4C of a degree; and analysis of published Bureau of Meteorology data on temperatures suggests another upward bias arising from failing to take account of the urban heat island effect from heat retained by buildings. These and other analytical failures by the IPCC and its believers suggest a substantial proportion of the total published temperature increase of around 0.8 of a degree over the last century is due to incorrect data calculations or natural causes. Even so, Obama’s revival of the dangerous warming threat, and his indication that serious attempts may be made to obtain an international agreement for reducing emissions, suggest that the climate change debate is now likely to be more active. For Australia, parts of which have experienced unusually warm May weather (attributed to the development of a high pressure system over the Tasman sea), and which could experience a warm winter due to natural causes from the development of an El Nino, any increase in temperatures will almost certainly produce Age-like misrepresentations that suggest dangerous global warming is back. However, despite the pathetic attempts by believers to suggest Australia is not doing enough to reduce emissions, estimates of our governments’ expenditure on emissions reductions run to about $15 bn a year, including through subsidies to use expensive renewable energy sources. Given the very considerable uncertainties about the effect of emissions on temperatures, there is a strong case for reducing such spending and, in the process, helping reduce the budget deficit. Recipients of this message may recall that I was the Principal Petitioner to a petition lodged in Parliament by Dr Dennis Jensen MP seeking an inquiry by the government on the costs and benefits of policies aimed at reducing emissions. Case Smit was a partner in this exercise. On 28 May I received from the Standing Committee on Petitions a copy of a letter to Dr Jensen by the Minister for the Environment, Greg Hunt. Minister Hunt’s response was largely to say that the government’s policy is to reduce emissions by 5% by 2020 through its Direct Action Plan. He thanked Jensen for bringing the petition to his attention. Relevant here is that Hunt had already sent a letter to Senator-elect Bob Day advising him that a White Paper on the Emissions Reduction Fund had been published and that “the Australian Government accepts the science of climate change and supports national and global efforts to reduce greenhouse gas emissions”. With assistance from me, Bob Day has now sent a reply to Hunt outlining reasons why the government should not accept the science (see below). This provides a useful summary of why Australia should reduce expenditure on emissions reductions and not agree to participate in an international meeting seeking an agreement on such reductions. Day’s letter to Hunt has been sent to Abbott. Might we hope he will pass a copy to Obama? Thank you for your letter of 12 May, 2014 and for your congratulations on my election to the Senate. Thank you also for your offer to provide a briefing on the Australian Government’s proposed Emissions Reduction Fund (ERF). In the Executive Summary of the ERF White Paper it is stated that the Government ‘accepts the science of climate change’ ie anthropogenic global warming (AGW) which postulates that ‘as emissions increase, temperatures will increase’, resulting in catastrophic consequences. The paper further states that the Government supports national and international efforts to reduce greenhouse gas emissions. Notwithstanding this uncritical acceptance of AGW, as you would be aware there are many unanswered questions about the science of AGW. The most obvious of these relates to the periods 1940 - 1980 (40 years) and 1997 - 2014 (17 years) when emissions increased significantly yet no increase in global temperatures was recorded. The latest report by the Inter-governmental Panel on Climate Change (IPCC Summary for Policy Makers) released on 31 March claims that “it is extremely likely that human influence has been the dominant cause of the observed warming since the mid-2Oth century”, yet the report offers no explanation as to why temperatures did not increase during the above periods. Further, the report acknowledges there is “continued uncertainty about the severity and timing of climate change impacts.” I note also that whilst the White Paper refers to advice rendered by the IPCC it makes no reference to the advice of the NIPCC (Non-Intergovernmental Panel on Climate Change). Significantly, there is also now a debate amongst scientists as to whether the current decline in the sun’s activity will actually lead to global cooling! Some scientists are predicting a repeat of the 1645 - 1715 ‘Maunder Minimum’ which was a very cold period indeed. It would be ironic if, after spending vast amounts of taxpayers’ money ($15 billion per annum according to some estimates) on action to reduce emissions in order to prevent ‘dangerous global warming’, that we were about to experience a colder, rather than warmer climate. It is commonplace I know to hear the refrain, ‘the science is settled’, however it is quite obvious from the above — particularly comments by the NIPCC, that this area of science is quite un-settled. In light of the above, it is clear ‘there is a need for an inquiry into this whole matter and that such an inquiry should be held before implementing the policies contained in the White Paper. As for a ‘global agreement’ on emissions reductions, as we know, over 60 per cent of emissions originate in poorer countries which rely on cheap fossil fuel for energy and have no intention whatsoever of reducing their use. It makes no sense therefore for Australia to voluntarily implement an emissions reduction program when no prospect of any such global agreement is likely. In addition to all this, as a Family First Senator I am particularly disturbed by the prediction that by 2020 the cost of electricity in Australia will be threefold what it is today due to the large amount of renewables being forced into the system. The impact on low and middle income households who do not have the resources to buy photovoltaic systems - even with government subsidies, but still have to contribute, through their taxes, to those who are able to purchase such systems, will be severe indeed. It is now abundantly clear that the Renewable Energy Target scheme should never have been enacted and plans for an Emissions Reduction Fund should be put on hold until a comprehensive inquiry has been held. modulated by natural multidecadal cycles driven by ocean-atmosphere oscillations, or by solar variations at the de Vries (~208 year) and Gleissberg (~80 year) and shorter periodicities. “greens” the planet and helps feed the growing human population. • No close correlation exists between temperature variation over the past 150 years and human related CO2 emissions. The parallelism of temperature and CO2 increase between about 1980 and 2000 AD could be due to chance and does not necessarily indicate causation. • The causes of historic global warming remain uncertain, but significant correlations exist between climate patterning and multi-decadal variation and solar activity over the past few hundred years. cooling rather than warming, despite continuing CO2 emissions. Source: “Executive Summary,” Climate Change Reconsidered II: Physical Science (Chicago, IL: The Heartland Institute, 2013). I'm the Lead Weather Forecaster for Firsthand Weather(firsthandweather.com) and I am telling you, Global Warming man-made or otherwise is a Hoax driven by an Agenda called GREED! And it has become plain and simple to see this! It is driven by money and power by way of the so-called Carbon Tax! Obama and Al Gore and all the rest intend on getting what they want by doing their best to scare the American People to death along with the rest of the world population! Well, guess what guys I'm sorry but some of us are just not that stupid. And I hope the American People along with the rest of the world will wake up and see this for what it really is! A Greed Filled Agenda which is being driven by money, power and the wealthy elite as a tool by which to gain even more wealth! And from all the science I have been studying over the past 50 years or so on weather and climate leads me to believe we are already in the early stage of a new 'Mini-Ice Age' or worse, and the next 10 years and beyond in the U.S. you will see winter weather become more severe than any have ever seen in their lifetime and beyond. And if you think warming up a little is a problem, then you have not even seen a true climate problem that would occur with a big temperature drop! The U.S. and the world as a whole are not close to being ready for an 'Ice-Age' as millions would die! I would welcome warming anytime over bitter cold! And if I am half right; The cold is coming soon and it will get worse and worse for years to come. Our kids may have a Big Problem to deal with and it ain't some Global Warming Hoax! All I have to say to the American People is; HELLO! It's time to wake up!!! Len Holliday(Lead Forecaster for firsthandweather.com). I agree , and am grossly disappointed at why the coalition doesn't abandon everything to do with this global gravy train climate con fiasco ! !